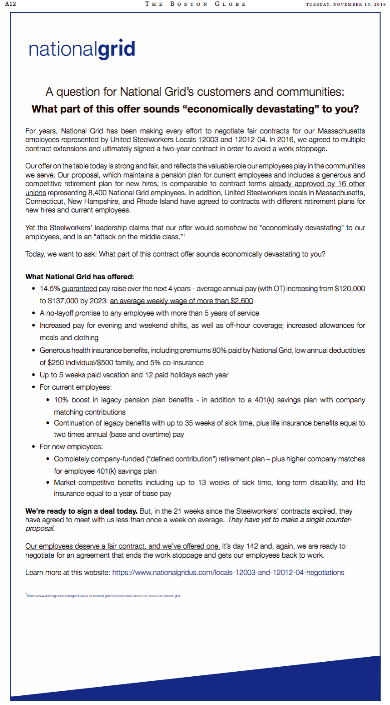 The four-month National Grid lockout of over 1,200 union gas workers has not only cost the state 1) millions in lost tax revenue and 2) more than $13 million in unemployment benefits according to this WCVB report, it’s also cost the company tens of thousands of dollars for this full-page ad in today’s Boston Globe. Something the ad failed to note: There’s movement at the State House to “force National Grid to restore health benefits to all locked out workers until contract talks are resolved,” according to WCVB’s report. That could ratchet up the cost of the lockout for the gas company. Something National Grid failed to note: There are two dailies in this town. Boston Herald readers also have a nickel in this quarter. Time to give the thirsty local tabloid some love, eh?